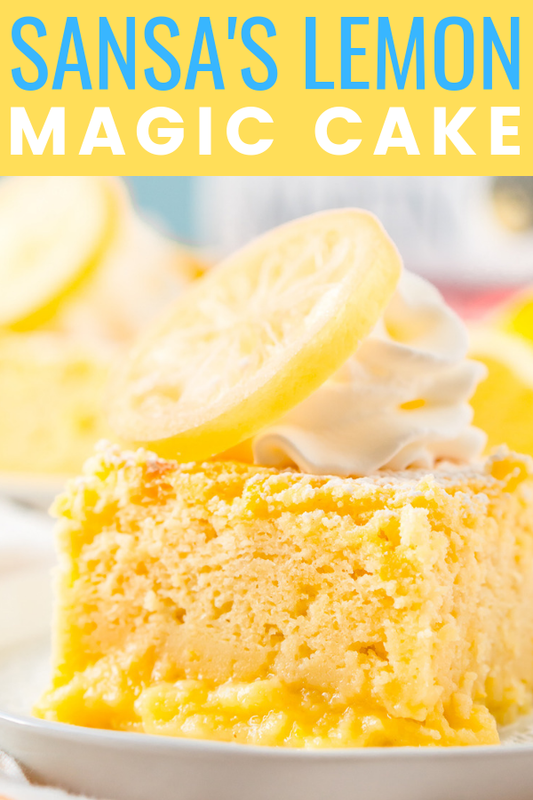 Inspired by Sansa’s favorite dessert in Game of Thrones, these Lemon Cakes are a delicious and zesty magic cake that separates into different textured layers as it bakes! 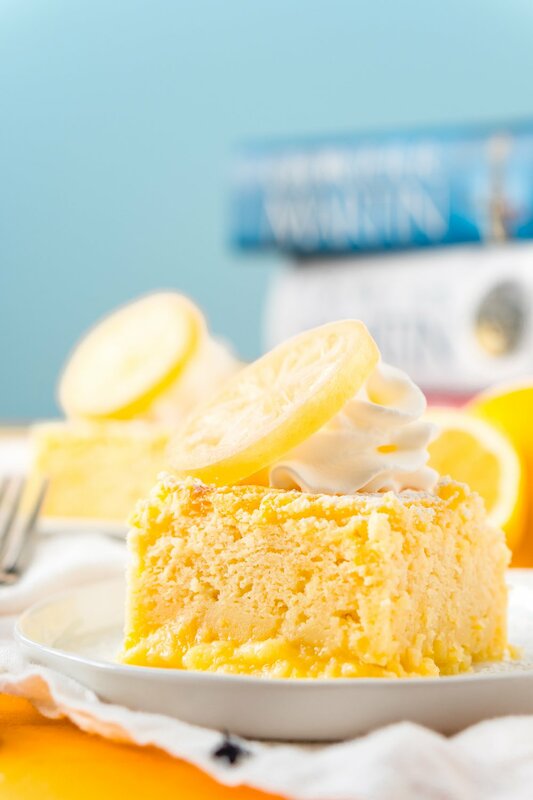 It’s hard to believe I originally published this recipe for Sansa’s Lemon Cakes 5 years ago this weekend and we were all sitting down to enjoy the season premiere of season 4 of Game of Thrones. And now, the final season is just a week away and I don’t know about you guys… but I am both so excited and not at all ready for this beloved story to come to an end. I’ve been living in the Game of Thrones fan world for almost a decade, I read the books between 2010 and 2012 and since we will likely never get another one of them – ahem – it seems as though this magical (and quite bloody) story is coming to its end. Tell Jon who he is. Rage against the Night King. Watch Nymeria and her pack tear up some wights (fingers crossed it will happen). Pray for a crazy appearance on Lady Stoneheart! And so much more… seriously, so much – like how are they going to wrap all of this up? Anyways, I should have updated this recipe years ago, because I soon realized that many of you don’t have time for 4-hour prep recipe, so I’ve made some slight adjustments to the original recipe to make it quicker and easier to whip up. This cake still needs time to set after cooking, so make sure to account for that. It’s still a Magic Cake. But What Is A Magic Cake? You’re probably wondering what a Magic Cake is, right? Well, it’s a cake that is one batter, but it separates into three different layers as it bakes. The end result is a light sponge layer on top, a creamy custard layer in the middle, and a dense layer on the bottom. It sounds pretty amazing, right? 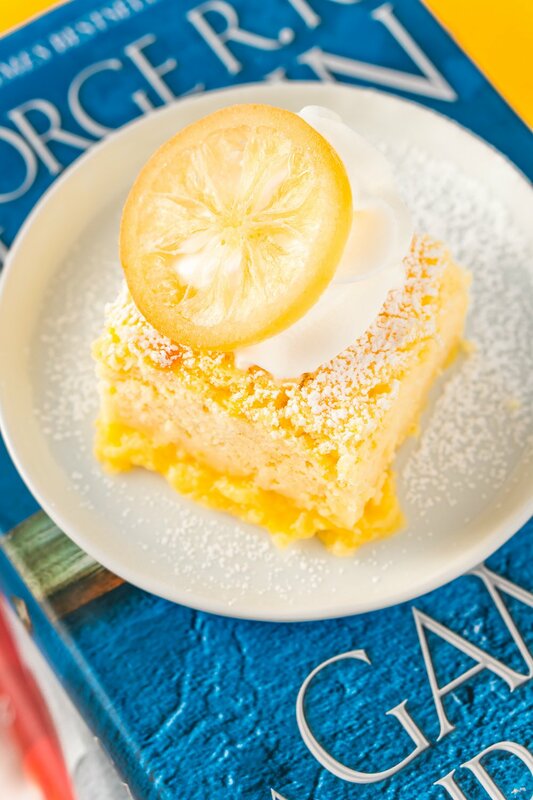 Add some lemon zest and juice and you’ve got this deliciously tart version! This cake simply just melts in your mouth! Buy Game of Thrones for $1.99 on Kindle Now! It’s important to pull your eggs and milk out of the fridge an hour or two before baking so that they have time to come to room temperature. 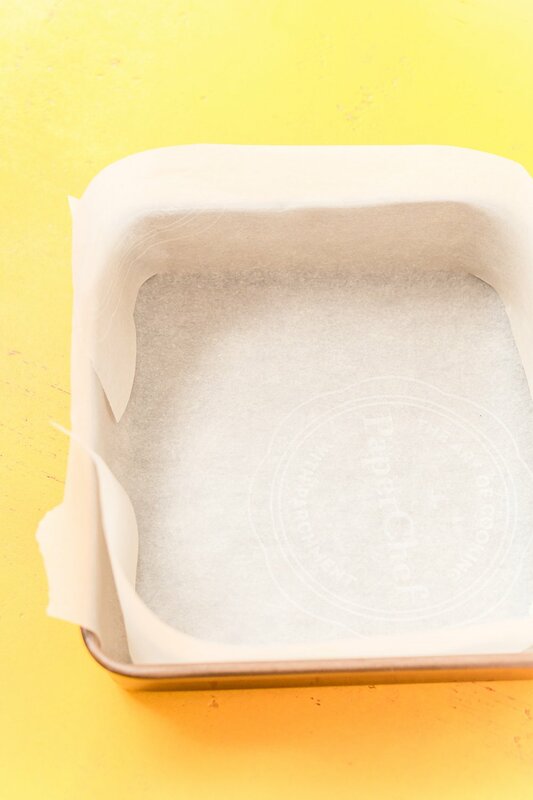 Then, begin by preheating the oven and lining an 8×8-inch baking pan with parchment paper. Cut slits across from each other on opposite sides of the parchment paper so it sits nicely in the pan. Next, beat your eggs whites in a stand mixer or large bowl until stiff peaks form. 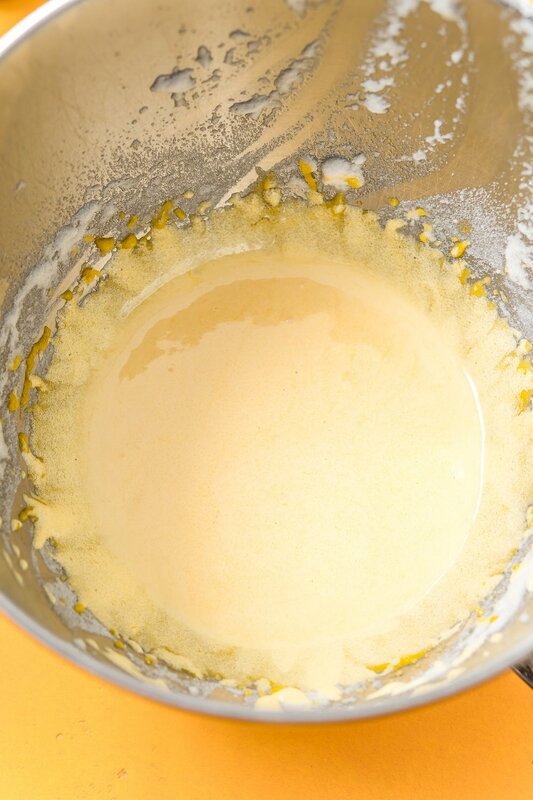 Transfer the egg whites to a separate bowl and then beat together the egg yolks, sugar, and water until pale yellow. Add in the melted butter and vanilla and mix until combined. Mix in the flour and then add the lemon zest and lemon juice and beat until fully combined. Then slowly add the milk while continuing to mix the batter. Lastly, gently stir in the egg whites, but not completely. The final batter will be lumpy, this is okay – you want those lumps! 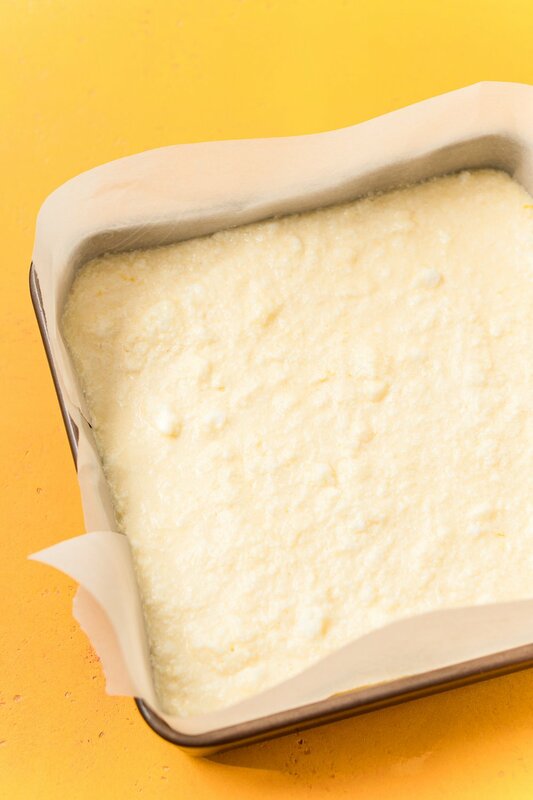 Pour the cake batter into the prepared baking pan and bake. Once baked, allow to cool to room temperature and then loosely cover and chill in the fridge for 4 to 12 hours for best results. Do not put the warm cake in the fridge or condensation can form and ruin the sponge layer of the cake. Check out this complete guide to Making Magic Cake. 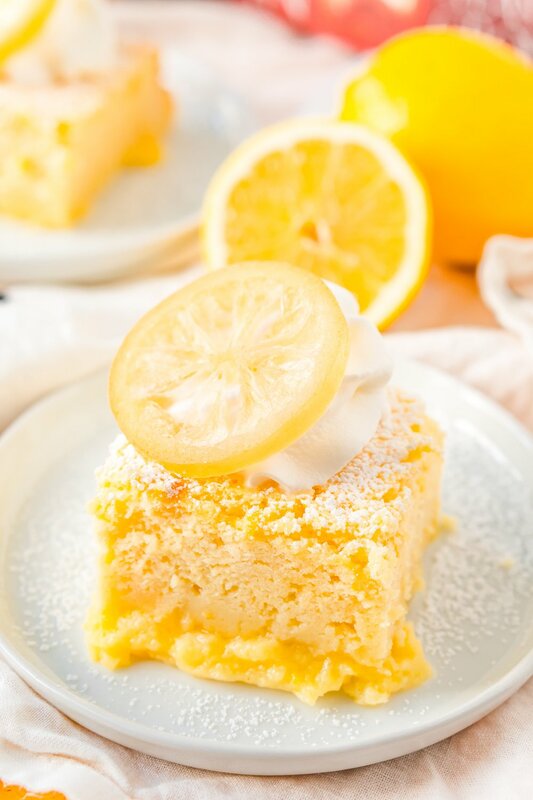 These Lemon Cakes Are So Delicious! When I started imagining this recipe, I wanted something more than the biscuits in the Game of Thrones cookbook or a standard cake, I wanted something impressive. I wanted something that was going to wow, something that was worthy of all Sansa’s talk in the books. I decided that a take on a Magic Cake would be perfect and I wanted to add some extra wow factors too! So I decided Candied Lemons, powdered sugar, and whipped cream were necessary to really push this dessert out the moon door! You can make your own candied lemons or I have personally started using the candied lemons from Trader Joe’s, they are super delicious and it cuts more than an hour off of the prep time for this recipe! Start An HBO NOW Subscription on Amazon to Watch Game of Thrones LIVE! We’ve come a long way in this story and it seems like things are still looking a bit bleak for our favorites. But I have faith in the Seven Gods that we’ll get a good ending because The North Remembers, and we’ll get our “bloody” revenge! Right? I mean, we just have to. Eek! I’m just giddy thinking about this season… that seems a little dark, I know. Matt is always telling me how weird it is for someone who loves cupcakes and pink so much to also love A Song of Ice and Fire (and other dark things) as much as I do! But hey, that’s me! Also, not to get too deep into theories because well, there’s likely not enough space on the internet for all that. 😉 But I have a strong feeling that Sansa will be one of the only ones left standing in the end. And as annoying as she was in the early books and seasons, I’d say she about outdid herself with her revenge on Ramsay and Littlefinger, don’t you think? Who do you think will sit upon the throne in the end – or will the throne even still exist? Regardless of what comes in the next couple of months, make sure you enjoy each episode with Sansa’s Lemon Cakes in hand! Buy Game of Thrones Cookbook Now! Fun and inspired recipes for your GOT viewing party! This post was originally published on April 6, 2014, and was updated on April 7, 2019, with slight recipe adjustments, written content, and photos. 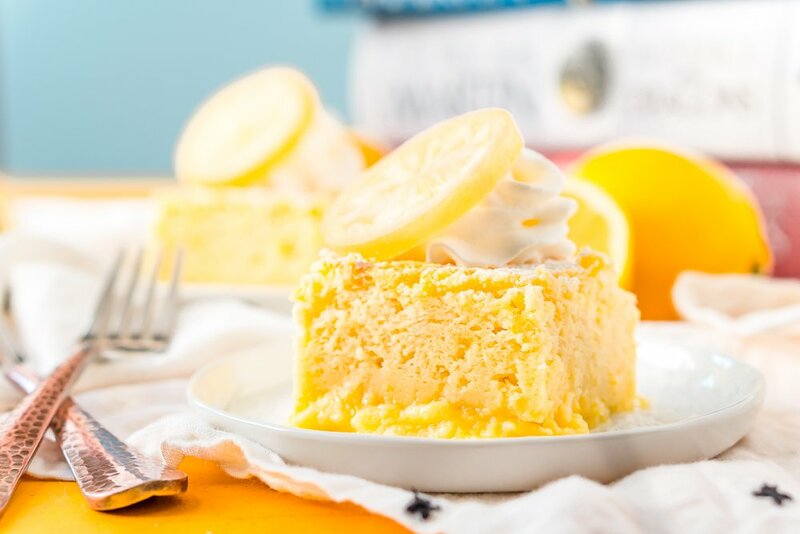 Inspired by Sansa's favorite dessert in Game of Thrones, these Lemon Cakes are a delicious and zesty magic cake that separates into different textured layers as it bakes! Preheat oven to 325 degrees F and line an 8x8-inch pan with parchment paper and set aside. 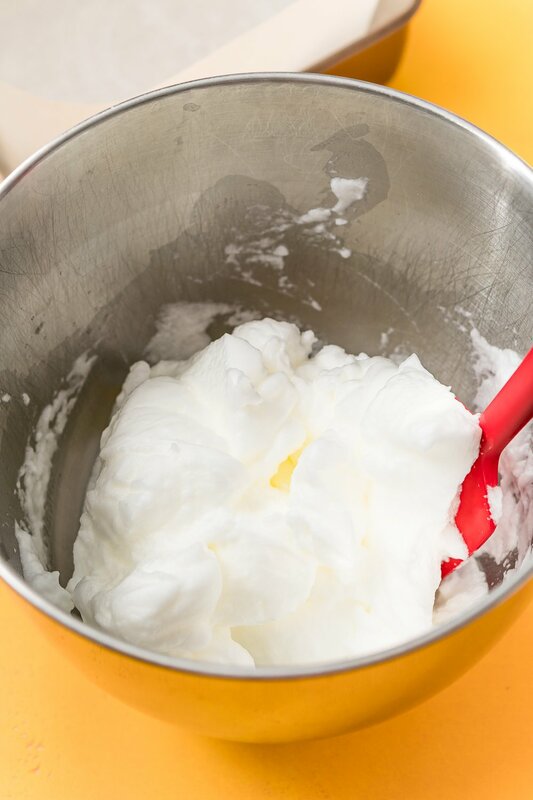 In a large bowl or stand mixer fitted with a whisk attachment, whip the egg whites on medium-high speed until stiff peaks form and transfer to a separate bowl. 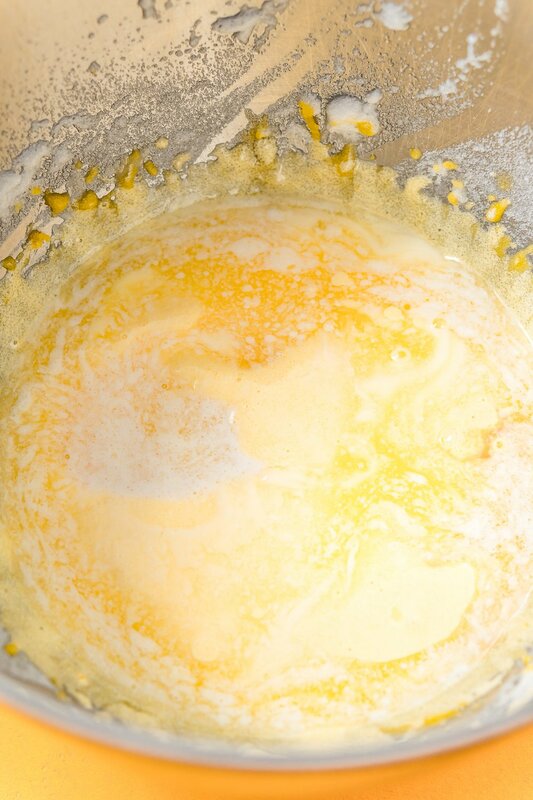 Add the egg yolks, sugar, and water to the mixing bowl and beat on medium-high speed for about 5 minutes until foamy and pale yellow. Add the melted butter and vanilla and beat for another minute, scraping down the sides as needed. Add the flour and beat until fully incorporated. Add in the lemon juice and zest and beat until thoroughly mixed. Slowly add in the milk while mixing until fully incorporated. Gently stir in the egg whites 1/3 at a time but not mixing them completely. You want lumps of eggs whites in the batter so the cake bakes properly. Pour batter into the prepared baking pan and bake for 50 to 70 minutes, the top of the cake should be golden brown and firm to the touch. Remove from the oven and let the cake cool completely to room temperature and then store loosely covered in the fridge for 4 to 12 hours before best results. Dust the top of the cake with powdered sugar. 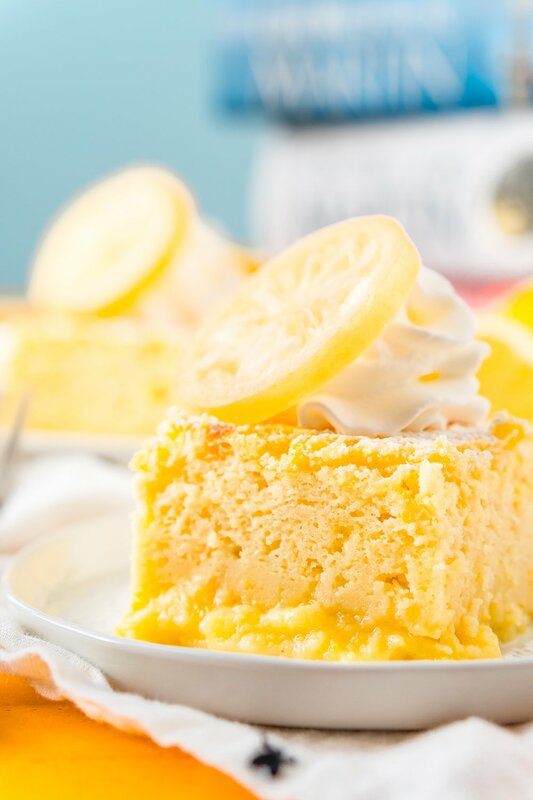 Slice cake into 9 slices and top with the lemon cream recipe below or just plain whipped cream and candied lemons. 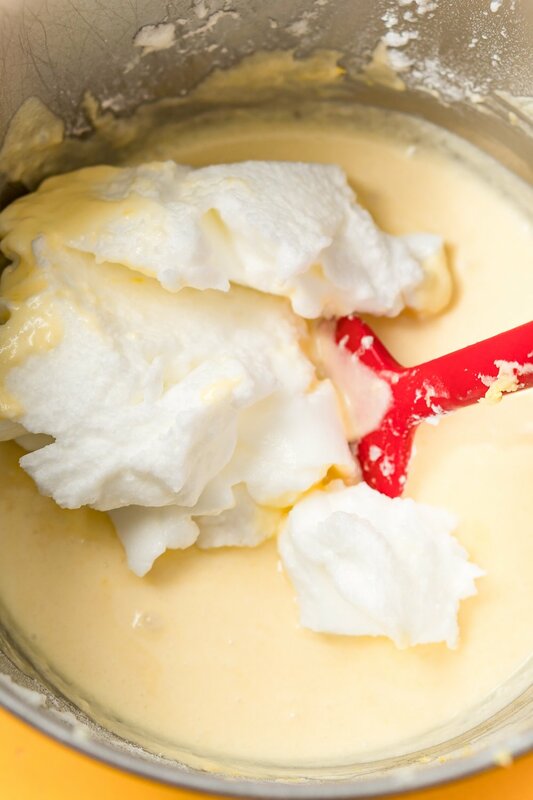 Add ingredients to a stand mixer or in a bowl and beat on medium-high until you have a light and fluffy cream. Pipe onto cake slices and top with candied lemons just before serving. Cake should be made the day it is served. Whip egg whites until stiff and transfer to a separate bowl. Beat egg yolks, vanilla, sugar, and water until light fluffy yellow. Add butter and beat for another minute or so. Add flour and beat until fully combined. 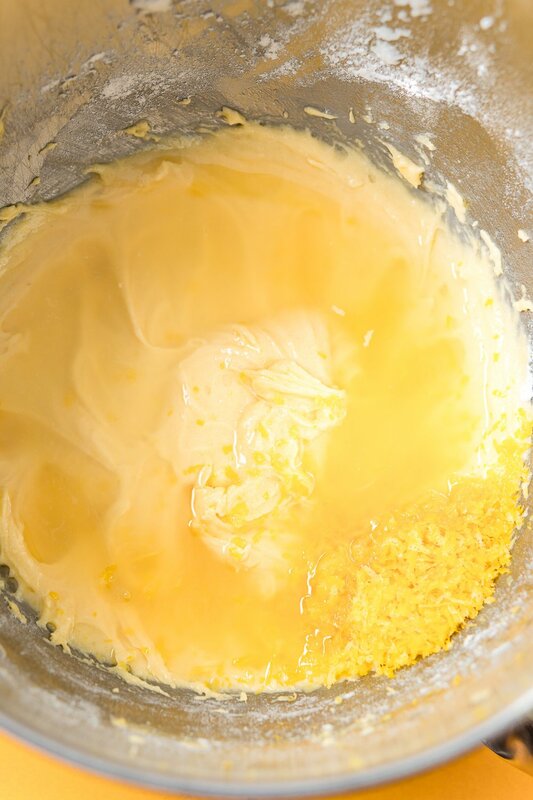 Add in milk, lemon juice, lemon zest, and lemon syrup until thoroughly mixed. Beat in egg whites on low until just incorporated, the batter should look a little clumpy, that's okay. Pour batter into a greased 8-inch pan, you can also use a 10 inch round pan, but the layers won't be quite as distinct, like in mine. Bake for 60 minutes, remove from oven and let set in pan for at least three hours. If you are making small cakes, use a biscuit cutter to cut them out of the large cake. 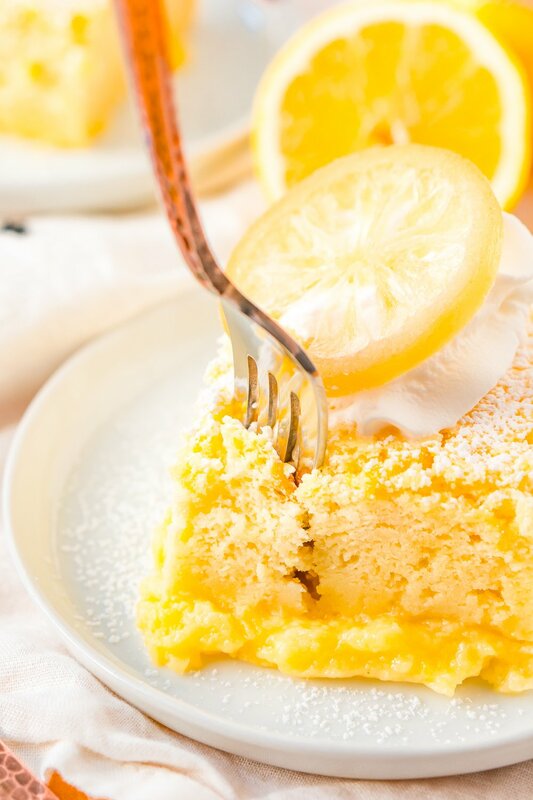 Top with the lemon cream and candied lemons. After 80 mins in the oven I pulled it out and it still had not set. 50 mins in the oven, It was too jiggly to be done. 3 -ten-minute bonus rounds and still not what I was looking for. The end result was a dry cake in top with a moist eggy film on the bottom. Bland Flavor. I was a little nervous with so the lack of any rising agents as well as the low flour to egg ratio. I didn’t even bother with the candied lemons or frosting. Didn’t want to take the chance if wAsting more ingredients. 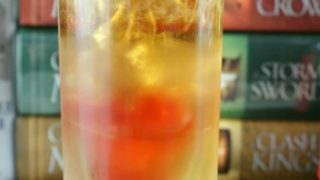 Gonna try another recipe for Sunday’s premier. I’m sorry you weren’t pleased with the final results. It sounds like you might have overcooked it. It will be jiggly since the bottom layer is a soft custard and is meant to be egg-like. The top layer is more like a sponge cake. We love this cake and have made it for all of the premieres for the last few seasons and it’s always a hit! Such a delicate cake and tart flavor, can’t wait to make it again for season 8! Can I make this cake today to serve for tomorrow? Should it be put in fridge? Or do I need to make it the day of? Thanks! Hi Katie, this cake is best served the day it is made, once cooled or chilled. 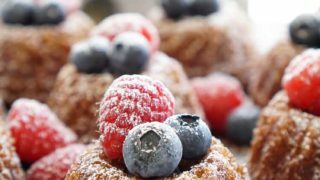 But you can make it tonight and put it in the fridge, just make sure the cake is completely cool when you put it in the fridge so that no condensation builds up and is absorbed into the top sponge layer. Also makes sure it’s loosely covered. What happens if you make this cake the night before? Hi Laura, this cake is best served the day it is made, once cooled or chilled. But you can make it tonight and put it in the fridge, just make sure the cake is completely cool when you put it in the fridge so that no condensation builds up and is absorbed into the top sponge layer. Also makes sure it’s loosely covered. Do you know if any adjustment is needed for altitude (5400ft)? Hi Natalie, unfortunately, I’ve never baked at high altitude so I can’t speak to what changes would need to be made for the recipe. I went to a games of Thrones Party and made Sansa’s Lemon Cakes. They were a big hit everyone loved them. When I was preparing them, I got my husband involved because you need to make them the day of an even.t. Which means the clock was ticking. It was hysterical he was all over the place with me in the kitchen. My husband is not a lemon kind of a person but these he enjoyed. These are fabulous anytime! I am thinking Easter! Oh when you are making them for the first time you have to have patience and give yourself amble time! So glad you enjoyed them and got your husband involved in making them! They would be great for Easter too! I’ve made this before and absolutely loved the cake! Just wanted to know if I can double the recipe, and then just divide between 2-8″ pans and cook as directed? I’ve got a big crowd to cook for this year! Hi Tabatha, I have never tried it so I can’t say for sure how it would turn out. Mine is in the oven now! Batter was amazing. Made my own candies lemon peels. Can’t wait to see how it turns out! Enjoy the cake and the premiere! Hi! I tried making this for the first time and the entire inside was like a custard. Do you know what I might have done wrong? I baked it for 50 min in our toaster oven. I wonder if I should’ve used the regular oven so the heat isn’t so close to the cake? Yes, this cake should have been cooked in a standard oven. Phenomenal! Just finished serving it at my GOT premier party. I actually used about 1/3 cup less milk than called for and it’s very light fluffy. 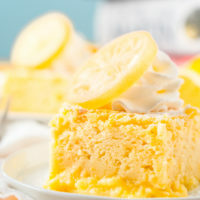 Confession: I served with canned whipped cream and a lemon wedge dipped in sugar. Total hit! I baked it for 57 min. Thank you so much for posting this. I am an extremely amateur baker and it turned out amazing! I made this again with the new recipe. I did not have the same problem with it being under baked inside, but the custard layer was just kind of odd…it wasn’t clear that there were 3 different layers and it had an odd mouth-feel. Had I served it to someone else they would’ve thought I made a mistake in making it . I think the old recipe was a lot better in terms of flavor. It had just the right amount of lemon and sweetness (because of the syrup? ), whereas the new one is just outright lemon-y. If anyone is thinking about making this for a party I would suggest doing a trial run beforehand. This is not a traditional cake, it’s meant to be a “magic cake,” and you may not like the texture. Is there any way you can put the batter into cupcake tins and it still come out okay? Hi Claire, I’ve never made this recipe that way so I’m not sure.